One of the important items we do not do for our clients is download and email statistics reports. There is a very good reason for this. 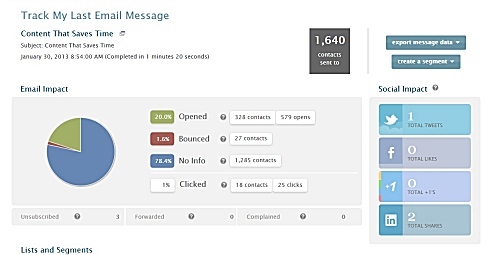 When email statistics are viewed inside your iContact account, they are presented in a user friendly way. It is simple to review any of the statistics iContact tracks - right down to the detail level. When those statistics are downloaded, a .csv file is generated that is opened in Excel. This file contains a single line item per action. No graphs, no intuitive compilation of the data, one line item per action. This means that when a subscriber opens your newsletter 15 times, it generates 15 line items in the file. 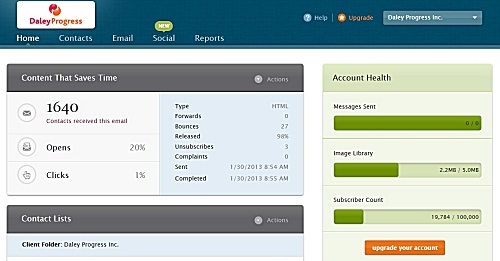 We recommend clients log into iContact and view their statistics within a few days of every send. There is valuable information that can aid your business decisions in the report. That value can be increased when you view them in conjunction with your website statistics. Once you log in, you will see a basic report on your last message sent. This quick view report offers you statistics represented in percentages. You can then click on any of the three icons down the left or use the 'Actions' drop down arrow at the top right and select 'Track Message' to open the larger report. The top of the report shows the same statistics represented in number of subscribers. Scroll to the bottom of the page. If it's your first time, you may have to click the big blue 'view details' button. You will see a more detailed report by subscriber for all the actions that could be taken by them represented as report type. You can click on any of the report types along the top to view the detail associated with that action - clicks, opens, unsubscribes. You can then check the 'Expanded Data' box to get even more detail. For example, the expanded data for 'clicks' shows you which link each user clicked on and how many times they clicked through. Reviewing your statistics regularly can help you determine how well your strategy is working, if you need to make changes to that strategy, and can even give you reasons to follow up with subscribers. While valuable, the information does have its limits and we caution you to view it with those limits in mind. opens: your message will be opened by some subscribers that do not show as having opened. This statistic can be affected by a number of subscriber email software issues which are beyond your control. forwards: will only show on the report if the message was shared through the 'Forward to a Friend' link in the footer of the message. If a subscriber shares by clicking forward in their email browser, it will not show here. bounces: can be registered if the subscriber has a full mailbox, the email is no longer valid, or some other technical problem. Unless a subscriber bounces 5 times in a row, they will show as bounced but not be placed in bounced status. Until the subscriber status changes to bounced, they will still receive your messages. View your iContact statistics regularly to help you grow your business or just to celebrate them!